If there is one car vehicle manufacturer on a roll, it's Volvo; and the star of its show is the XC40. The SUV was named a finalist in the 2019 South African Car of the Year. And now, the luxury SUV has been named the winner of the 2018 Women's World Car of the Year. The Volvo was chosen after two rounds of voting. The Volvo XC40 is a compact luxury crossover SUV manufactured by Volvo Cars originally designed by Thomas Ingenlath and revealed in September 2017. According to Charleen Clarke, a South African judge on the Women's World Car of the Year judging panel, the XC40 found favour with many of the journalists. Clarke says: "In summary the judging panel found the XC40 to be a balanced, well-rounded and stylish car, which is great to drive and well equipped. "They gave its intuitive entertainment system the thumbs-up and also commented on its excellent chassis. Pricing is fair for the space and equipment on offer and the safety features of the XC40 are the icing on the cake." The judging panel for the Women's World Car of the Year comprises 34 female motoring journalists from around the world. "We don't just pick the best car for women. We pick what we believe is the best car in the world." Wheels24's Janine Van der Post is one of the 25 jury members participating in the 2019 SA Car of the Year competition and says: "The Swedish offering is stunning in more ways than one. I love the two-tone look on the XC40 and it offers all the trimmings one would expect from Volvo. "Most importantly, not only does it have great tech and safety features, but it's really practical and spacious - key elements to women looking for a good all-rounder." The Women's World Car of the Year award and the 2019 AutoTrader SA Car of the Year finalist status, are not the first accolades for the XC40. Volvo's newest, smallest and least expensive SUV was also named the 2018 European Car of the Year at the Geneva Motor Show. George Mienie, AutoTrader CEO, comments that it is impressive to see how the Volvo brand has evolved over the past eight years: "Since Geely’s purchase of Volvo back in 2010, and under their stewardship, Volvo has produced some exceptional products." "Three of those – the XC90, XC60 and XC40 – are all SUVs. And they have all been successful. Volvo is also doing good job of moving to alternative forms of propulsion. In fact, all its car models launched after 2019 will be either fully electric or hybrids." Charmagne Mavudzi, Head of Marketing and Communications, Volvo South Africa, said: "The XC40 is going from strength to strength, both locally and abroad. We are proud to win this international accolade, and to be nominated locally for the SA Car of the Year competition. We are closing 2018 with a bang!" 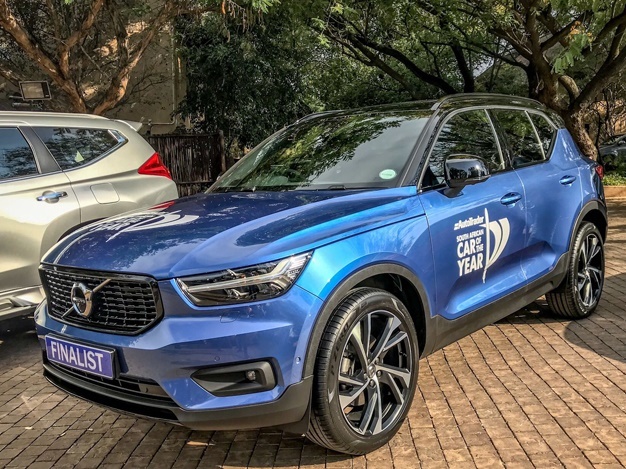 Now, the question on everyone's lips is this: can Volvo continue its path of success and add yet another award - 2019 South African Car of the Year - to its trophy cabinet? No one knows the answer to this question; the winner will only be announced next year. Perhaps the string of good fortune can be attributed to the name - ‘Geely’ afterall is the Chinese word for 'lucky'.